As part of its work, Semilla de Sol has built participatory management models to develop community-level renewable energy projects. These models include a strategy to foster gender equity in the implementation of their projects in the Ixil and Zona Reina regions in the Department of Quiché, in Guatemala. 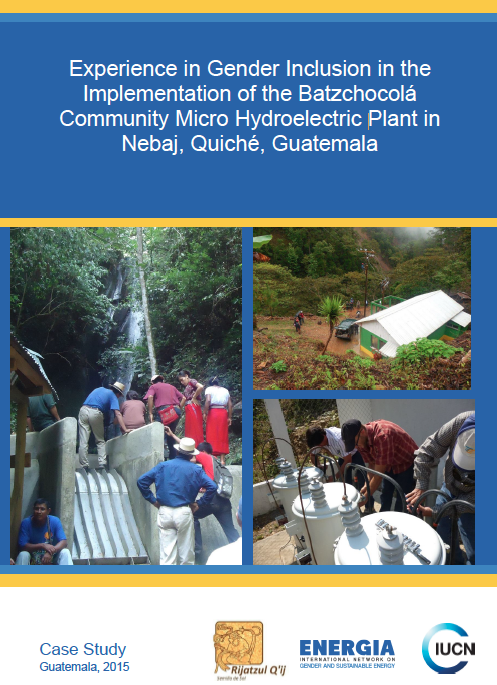 The Batzchocolá Community Micro Hydroelectric Plant, located in the community of Batzchocolá, is part of the community renewable energy micro-enterprise model that Semilla de Sol promotes and advises in poor, rural, and indigenous communities in Guatemala. The objective of the project is to provide electric energy service to the population in the villages of Batzchocolá and Laguna Batzchocolá in the Municipality of Santa María Nebaj, and Visiquichum, in the Municipality of San Gaspar Chajul, Department of Quiché, taking advantage of the local availability and potential of the water resources, to help improve living conditions, create job opportunities, and increase household income.